We all talk environmental rights when it comes to the great Serengeti “commercial road development” debate, but what about affected human rights? What about equality? What about social and environmental justice for all? Anyone who thinks they can wade into this space – especially “online” – by waving their “green” banner, is quite simply a naive keyboard mouse. Let’s review, briefly, the history of the region that is home to this priceless natural treasure. For more than 2000 years, wild animals have roamed and grazed these “endless plains”. For the past several centuries, the proud and noble Maasai peoples have lived on these lands, in complete harmony with nature. Then, through European exploration about a century ago, this utterly unknown, pristine wilderness was discovered. Over the next few decades, the British government, then “rulers” of the region, created conservation areas and moved the indigenous Maasai from their ancestral lands. Over time, fences were raised, controls were implemented and more and more humans were forcibly removed to much poorer grazing lands that were somewhat arid and dry. Natural conservation areas grew and eventually a national park of international renown took shape. Post-independence, the father of modern Tanzania, President Julius Nyerere and his government pledged that these great lands and their rich nature would be preserved for posterity. 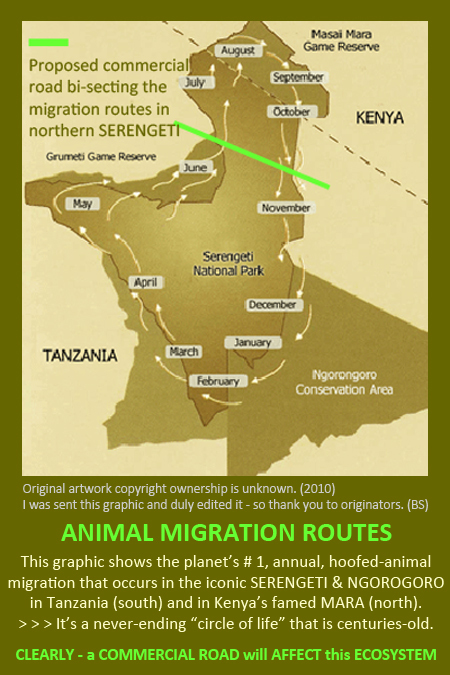 The Serengeti National Park grew in extent. More people were moved to more poor areas and, finally, in 1981, this iconic wonderland was inscribed as a World Heritage Site, under UNESCO. So – I have to ask myself: here is the world celebrating this new, priceless, global-land ownership, but at what price did it come to my fellow African brothers and sisters, and their ancestors? And what is the world doing to repay this “debt”? From before this inscription and subsequent to it, more lands have been declared conservation areas and today the wider national parks region includes the Ngorogoro Conservancy Area. All the while, the communities affected by such developments and the growth of eco-tourism regionally have been increasingly marginalized. Tanzania is actually one of the world’s poorest nations. It has a little over 43m people (according the World Bank estimates in 2009). It’s land area is roughly equal to the combined areas of France, Germany and Belgium. In terms of conservation, approximately 14% of its land area is protected, making it number one in the world. Tourism is the nation’s largest economic driver and almost 25% of their foreign income is from this source. Now that you’ve previewed the actual migration routes and the potential implication of a commercial road development, let’s review a regional map, showing the greater infrastructure and geography, current, planned and under consideration by various role-players in this matter. The singular issue vests with the most basic fact – there is NO decent road infrastructure east or west of the northern park regions where those most affected by resettlement now live. Collectively, there is almost a half a million people east of SENAPA and another 1.5 million in the west Mara Region whose basic human and socio-economic upliftment needs are involved in this road development matter. It is their voices and needs that I hear so strongly. And they’re not speaking specifically about land restitution rights, schools, healthcare and basic infrastructure (i.e. water, sanitation, energy, etc) needs which are other critical issues to them. Their starting point is a decent road network, because they know that from that can flow all the other socio-economic development needs in due course. This is where the world seems to have “lost the plot”. SO WHY THE “SCALES OF JUSTICE”? From this overview, one can clearly see a critical issue that needs to be fully addressed. Greatly improved ROAD infrastructure within communities living east and west of the park. Nothing more. Nothing less. So who is actually thinking “social justice” here? I’m not going to get into analyzing this statement, suffice to say – as was recently pointed out to me – their position seems to hinge on “fencing” the planned commercial road, and thus causing a great disruption to animal migrations. You interpret this statement of theirs as you see fit. Please don’t listen to me on this. Then there is the African Wildlife Foundation. Unlike FZS, the AWF has a clear focus of working with communities affected by conservation. They have highly respected programmes in this regard, so are therefore a very credibile source of opinion – in my mind, anyway. 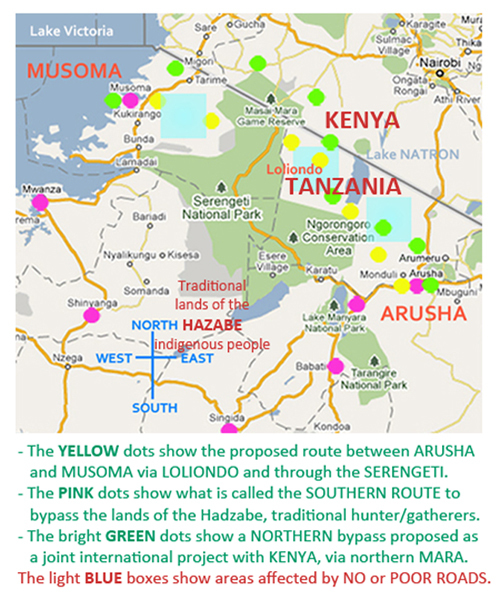 In their detailed statement of this date – which EVERYONE who cares should read, as a starting point – AWF states, under Point (8.b) that “…We know of no evidence of any significant direct trade between Mugumu and Loliondo.” To me, this implies no seemingly valid reason to “join” the road networks east and west of the park, as other commercial options exist, even if more expensive to the transporter/carrier. It needs to be VERY clearly noted that their statement (and accompanying maps) place new road infrastructure east and west of the Serengeti FIRST on any regional/national road construction programme. They, in fact, call the east and west roads – Phase ONE. So, at least they understand prioritizing marginalized people FIRST, unlike some others in this debate! 3. Tour operators have been canvassed because a severely disruptive natural phenomenon will greatly affect their eco-tourism businesses. If you are but ONE of these parties, I ask the most simple question – did you speak out “fully informed”, considering all matters present, as any good court would do, or did you “buy” the first “tree-hugger” banner that came your way? If you were a scientist, did you – in honest, scientific terms, consult a human ecologist? If you were an environment petitioner, did you consult a “human rights” activist? If you were a “tour operator”, did you consult the communities that have actually created a centuries-old legacy that has given you a commercial opportunity today? I hope by my making these points above, your mind is ticking. That’s all I seek to do, to engage objective debate. This is NOT about a “southern” route or any other route. It is NOT about better community infrastructure, such as schools, hospitals, etc, but rather about the much needed “road” to such future infrastructure, for the great benefactors of Tanzania – and the world at large – namely the MAASAI PEOPLE. Given that we have a nation with a Per Capita GDP of around US$ 600 per annum in respect of Tanzania, and therefore a weak fiscus and low tax base, how can any reasonably educated citizen of the world think that this nation has boundless resources. It does not, as evidenced by its high borrowings. This means quite simply – Tanzania must cut it’s suit according to it’s cloth AND deliver on decades old promises – build overdue road infrastructure east and west of the Serengeti FIRST, and then see what funds are left to develop other community infrastructure next – e.g. the south. REMEDY those affected by decades of displacement and re-settlement FIRST. To me – any other position decries social justice and I therefore weep for such foolish thoughts of humanity. Tanzania got the Independence about 50 years ago, then I think the governments (all of them from the same rulling party) are the main responsible of the current bad situation that are suffering the local communities and pastoralists living west, east and also south from SENAPA and NCA. What have they (the government) done with the taxes coming from tourism industry, the park and visa fees coming from tourists…..? What have they done with the hundreds of thousands $ they are receiving from foreign aid (a 3rd portion of the total amount of the national budget? Many people from local communities and pastoralists get jobs from tourism but they’re bad paid while a tourist pays a lot of money to the owners of the lodges. The Tanzanian government could do something about it by labour laws. After about 50 years from the independence day, now the only solution that the government is going to do for improving the way of life of the people living around SENAPA is simply a road crossing North Serengeti. Will people living around there take profit from this infrastructure? Maybe they will only see big trucks driving fasst in front of their homes. I’ve travelled through 17 african countries and this is what I have seen: trucks driving fast in front of the noses of the local communities and no benefits for them, no schools, no hospitals, only big companies doing business. Electricity running over thei homes but without electricity for them because they haven’t the money for paying it. You write an interesting, mostly correct, view of the past history of the Serengeti. There are a few misconceptions and inaccurracies in your summary. Firstly …. and interestingly, there are almost no fences bordering the Serengeti. Aside from a few metres on either side of some gates in the west, and a fence or two keeping humans in at the Seronera workshops, it is amazing that there are basically no fences. In fact it would be possible to walk from Ndabaka gate to Arusha town and not come across a fence! When you state “All the while, the communities affected by such developments and the growth of eco-tourism regionally have been increasingly marginalized.” you are right, but how much of this due to the creation of the national park? In the early days when the park was created this is definitely true, but is it in terms of today? Will the planned road put this to right? In fact and ironically, your statement is right in terms of today, mainly because despite laws and acts passed to allow the people living in the borders to benefit from wildlife, the government has basically stymied any efforts of the local people to achieve such benefits. The Village Land Act gave them an opportunity to almost have their own mini reserves and generate revenue from wildlife, but a conflicting Wildlife Management Act ultimately gave any crucial powers to the head of the Wildlife Division. What I am saying in short is that we do not know what possibilities there would be, and how much local people could earn from protecting and living off wildlife and “wild” lands through tourism (or perhaps even cropping) because the experiment has not been allowed to happen. What we do know is there is revenue to be earned from this, and each year the price tourists will pay increases. Park fees have incresed from around US$10 per day to over $100 per person per day in the Serengeti (for entry and private camping, and not including more fees that camp staff and vehicles must pay). We should be asking – Are people living in community owned reserves in Botswana (because there they can) earning good revenue leasing their areas for fancy lodges? If so, why doesn’t Tanzania follow up with its Village rights and alter the WMA regulations to make community reserves possible? You mention that Tanzania is one of the worlds poorest nations with a population of about 43 million. Did you know that the population is increasing at about 2.7% p.a. That in 1960 it was about 5 million? So, while unfair regulations moved people out of the park (in the 1950s)… people who subsisted in a transhumance system of life that worked well, more recently these people are being affected by population growth. Life is getting increasingly more desperate for them. They need food, …. and jobs. To me this is a red light! Will Tanzania kill the goose that lays the golden egg? Each year wild areas and places with dense wildlife become more rare. This increases their value – hence the increase in park fees (It currently costs US $500 per hour to see mountain gorillas, and this WILL increase, and people will pay it). Many places in the world have minerals, farm land, cities, highways…. How many places have the Serengeti and its migration? How much could Tanzania really earn from this asset? In fact if the Maasai were allowed to try out competing ways of earning revenue from the land (cattle, wildlife, hunting, photographic, hiking or a mixture) what would the ideal combination be? Or would a road bringing people to farm, to live off poaching and charcoal burning (as it is easy to sell meat and charcoal when trucks pass by hourly) be better? Interestingly, do you think these people who WILL arrive with a road be Maasai or other more settled tribes? – people skilled at farming, and lured by the new road, and the good green soil. When you review the regional map, would it be fair to look at Tanzania as a whole as you do this? If you do you will be right in seeing that the Lake region is very heavily populated and in need of better roads. You will also see that Loliondo and the Natron area in on a par or better than most of Tanzania. There are LOTS of areas of Tanzania than need a tarmac road. In fact there is no tarmac between Songea and Tunduru. There is no tarmac between Mbeya and Tabora. In fact there is still no tarmac road between Arusha and Dodoma, Singida or Mwanza! 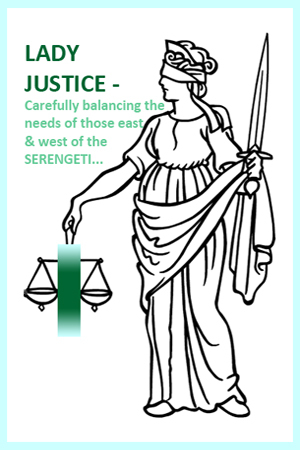 You state “This means quite simply – Tanzania must cut it’s suit according to it’s cloth AND deliver on decades old promises – build overdue road infrastructure east and west of the Serengeti FIRST, and then see what funds are left to develop other community infrastructure next – e.g. the south.” – That is rubbish…. Why should east (sparsely populated and potentially an area that could do well from its wilderness) and west (yes, densely populated) of the Serengeti take precedence over the south (also densely populated and en route to the rest of the country)? To the “road”…. The issue is firstly whether this new tarmac road will destroy or undermine something that is or could be of great value to Tanzania, and secondly whether there are ways to achieve the goals of the road without undermining this asset. I have emphasised the possible value of the Serengeti above, and most of the road plans provide a viable solution that should be carefully considered before the road goes ahead. That is an alternative circuituous tarmac road. Amazingly the populous areas between Babati and Singida and from there to the Lake only have patches of tarmac road. They badly need a tarmac road too. That is why currently the Serengeti National Park is being used for a road now, even though it is a dirt road (as the President stated). It is becuase TANAPA regularly maintain and grade the road through the Serengeti. Truck companies would rather pay the higher park fees and take this better quality (and shorter) road than go around. If a tarmac road was built all the way from Arusha to Mwanza along this southern route it would alleviate all of this, improving communications for the people living in this more densely populated area. I know the Serengeti and the Loliondo areas well, and have thought about this a lot. I constantly need to be more “informed” and am careful how I come to decisions… It seems to me you have jumped to a few conclusions without much balanced assessment on this very complicated issue. I should end reminding everyone that this decision is important because once it is done it cannot be undone. The north will become heavily populated, the Maasai will be marginalized quicker, the park will be threatened, the numbers of animals migrating will be reduced. The question is would these people be more likely to have a job when they can’t earn a living from tourism and wildlife? Will they do better farming, living near the road? Or will the dead resource be something they really regret losing? Justin – firstly sincere apologies for missing your pending post & late “approval”. I’m embarrassed as it is important for publishing! I agree with you on your point about “village rights”. In trying to summarize what I wanted to say in overall terms, I was certainly liberal in my comments about people being marginalized. This in itself is cause for an entire separate debate – and they’ve been on-going for years, and resolution is needed. There are many better solutions, but the government is not listening to the people and some key advisers. I think that addresses your comments about connecting to the lake region. To conclude – perhaps I have seemingly jumped ahead in arriving at my conclusions over road infrastructure in the Ngorogoro & Monduli districts. I do not know the region at all, and have relied on dozens of conversations and correspondence with NGO’s, community leaders and social activists in Arusha, Loliondo and elsehwere in TZ. They all seem to speak with one common, overall voice. Rightly or wrongly, I have assumed their broad-based consensus position on better road needs, and have ignored any discussions here about their land rights, which are highly emotive and urgently in need of addressing, as you touched on in the beginning of your post. I’m certainly happy to learn more and re-think matters.